Micromuscle AB is now commercializing this technology for medical applications. If a film of volume-changing material (e.g. the conjugated polymer) is attached to a film that does not change volume (such as a metal electrode or a film of an inert polymer), then this bilayer will bend. 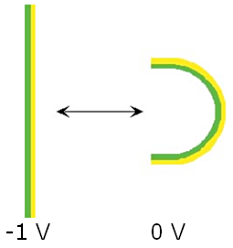 In the schematic below, the polymer (we use polypyrrole, PPy) is shown as green and the second layer (we uses gold, which then also serves as the working electrode) is shown as yellow. The volume of the polymer is changed by an applied electrochemical potential. Here are some PPy/Au bilayers microfabricated on a silicon substrate (using surface micromachining and the differential adhesion method (link to patent), shown looking straight down from overhead. I made these devices while I was at Linköping University in Sweden, working with Prof. Olle Inganäs. The bilayers are 1 mm long and 30 µm wide, and they are attached on the bottom edge. They are shown going from straight to curled up. The cartoons on the left show side views of what is happening in the photographs. The entire wafer is immersed in an aqueous electrolyte (0.1 M NaDBS) and serves as the working electrode; the counter and reference electrodes are not shown. E. Smela, Olle Inganäs, and Ingemar Lundström, "Controlled folding of micrometer-size structures," Science, 268 (23 June), 1735-1738, 1995. 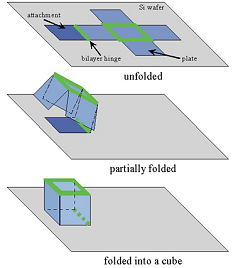 Photos in the figure are from E. Smela, Olle Inganäs, and Ingemar Lundström, “Controlled folding of micrometer-size structures," Science, 268 (23 June), 1735-1738, 1995. The videos below are all in real time. The actuators move from completely flat to fully curled and back (to/from fully oxidized to/from fully reduced) in about 1 second (the PPy is ~0.5 µm thick). QuickTime Format. File size is 3MB. Quicktime Player required for viewing. You can download a free player HERE. Bilayers by themselves simply curl up, but a bilayer attached to a s ubstrate, such as a silicon wafer, can be used as a hinge, for example to rotate a rigid plate out of the plane of the wafer. These devices were also described in the Science 1995 publication. For a Flash animation of a plate rotating (kindly made by Peter Warkentin), click here (this will take you off of my site but open in a separate page). Quicktime Player required for viewing. For a video showing this self-folding box opening and closing in real time, double-click the image below. These 2 videos show boxes folding around grains of sand. File sizes are 3MB each. This video shows a whole array of self-folding boxes. E. Smela, O. Inganäs, and I. Lundström, "Conducting polymers as artificial muscles: challenges and possibilities,"
J. Micromech. Microeng., 3 (4), 203 (1993). 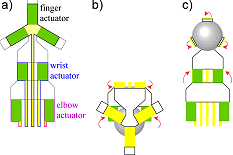 E. Smela, O. Inganäs, Q. Pei, and I. Lundström, "Electrochemical muscles: micromachining fingers and corkscrews,"
Adv. Mater., 5, 630-632 (1993). E. Smela, Olle Inganäs, and Ingemar Lundström, "Controlled folding of micrometer-size structures,"
Science, 268 (23 June), 1735-1738, 1995. E. Smela, "Microfabrication of PPy microactuators and other conjugated polymer devices,"
J. Micromech. Microeng., 9, 1-18 (1999). E. W. H. Jager, E. Smela, and O. Inganäs, "On-chip microelectrodes for electrochemistry with moveable PPy bilayer actuators as working electrodes," Sens. Act. B, 56, 73-78 (1999). E. W. H. Jager, E. Smela, O. Inganäs, and I. Lundström, "Polypyrrole microactuators,"
Synth. Met., 102 (1-3), 1309-1310 (1999). E. W. H. Jager, E. Smela, O. Inganäs, and I. Lundström, "Applications of polypyrrole microactuators,"
Proc. SPIE's 6th Int. Symp. Smart Struc. Mater., Electroactive Polymer Actuators and Devices (EAPAD), Newport Beach, CA, (SPIE), vol. 3669, edited by Y. Bar-Cohen, p. 377-384 (1-2 March, 1999). E. W. H. Jager, E. Smela, and O. Inganäs, "Microfabricating conjugated polymer actuators,"
edited by G. Riva and F. Davide (IOS Press, Amsterdam, 2001). Edwin Jager, who was co-supervised by me and Olle Inganäs at Linköping University, used this approach to realize a micro-robot arm. It was able to pick up and reposition a bead entirely under electrical control. To our knowledge, this is still the only microfabricated robot arm ever made. You can see a video here. The example on the left was made by surface micromachining, and the rigid plates were polymeric. Silicon plates defines by bulk micromachining can also be made (follow link for fabrication). After etching, this plate was attached to the wafer only by the PPy/Au bilayer. In the figure the plate was rotated out of the plane of the wafer by ~120 degrees. 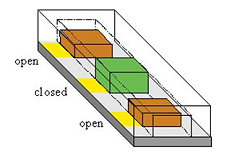 Figure is from "Electrochemically Driven Polypyrrole Bilayers for Moving and Positioning Bulk Micromachined Silicon Plates," E. Smela, M. Kallenbach, and J. Holdenried, J. Microelectromechanical Systems, 8(4), 373-383, 1999. 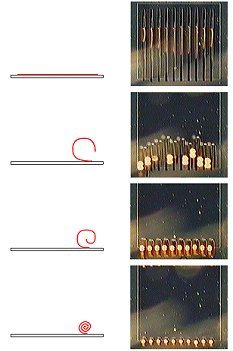 The sequence above shows a second plate that has been held stationary at various angles by potentials at which the polymer is intermediate between the fully oxidized and reduced states. This video shows this actuator holding a couple of fixed positions. These actuators are robust: they operate even when they come into contact with macro-scale objects from the outside world. For a video of earlier-generation bulk Si actuators, click below. E. Smela, M. Kallenbach, and J. Holdenried, "Electrochemically Driven Polypyrrole Bilayers for Moving and Positioning Bulk Micromachined Silicon Plates," J. Microelectromechanical Systems, 8(4), 373-383, 1999. It is interesting to put an active device on a moving silicon plate; an example is presented here of a moving electrochromic device. Electrochromic 'Pixel' Based on Polypyrrole,"
E. Smela, Advanced Materials, 11(16) 1343-1345, 1999. Polypyrrole changes color as well as volume when the oxidation level changes. 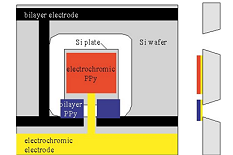 The outer electrodes (black in the figure above) change the potential applied to the two PPy bilayer actuators (top to bottom), and a second electrode (yellow in the figure above) changes the potential of the PPy film on the plate (side to side, center row). 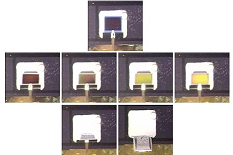 Figure is from "A Microfabricated Movable Electrochromic 'Pixel' Based on Polypyrrole," E. Smela, Advanced Materials, 11(16) 1343-1345, 1999. For a video showing this device in action, click below. 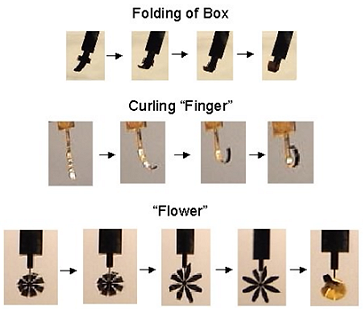 The idea of turning 2D shapes into micro-scale 3D structures by folding is an interesting one, since microfabrication is typically limited to 2D. However, these structures are usually manually folded, or folded all at once using e.g. solder. To control but automate the folding step, one can use PPy/Au bilayer hinges, as shown below for simple structures made from Kapton substrates. Follow this link for the fabrication sequence. This work was done by Yingkai Liu and Hyo “Lance” Oh. (and then dropping it), double-click below. The bending bilayers above all made use of the in-plane strain, which is approximately 3%. The out-of-plane strain is much greater, about 30%. We are exploring the possibility of using this to fabricate pumps and valves. E. Smela and Nikolaj Gadegaard, "Volume change in polypyrrole studied by atomic force microscopy," J. Phys. Chem. B, 105 (39) 9395-9405, 2001. E. Smela and Nikolaj Gadegaard, "Surprising volume change in PPy(DBS): an atomic force microscopy study," Advanced Materials, 11 (11) 953-7, 1999.